Nicki Parrott joined by Houston Person! 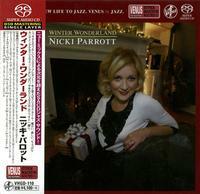 Acclaimed bassist and vocalist Nicki Parrott is joined by sax player Houston Person, pianist John di Martino and a host of competent musicians for this album dedicated to songs of the winter season including several Christmas tunes. You'll find such songs as "Have Yourself a Merry Little Christmas", "Blue Christmas", "June In January", "I've Got My Love to Keep Me Warm", and of course, "Winter Wonderland." Japanese pressing.